Nice try, Mr. Mayor, but do better. Such programs are part of the Council’s official response to the mayor’s preliminary budget for the fiscal year that starts on July 1 — a $92.2-billion fiscal plan that offers “few major new initiatives,” the Council’s response sniffs. Expand the NYPD’s understaffed Collision Investigation Squad, which investigates serious crashes yet has only 25 cops assigned to it. The Council wants that team to grow to 40 officers — at a cost of $2.3 million — to “allow for more effective investigations and help find those responsible for fatal and near-fatal accidents.” Full investigation is seen as a key to better enforcement against reckless drivers. The Council would also expand a program that beefs up evidence collection at crashes, currently only a pilot effort out of the Manhattan North command. “Across New York City, only around five percent of … serious injury crashes that occur every year are fully investigated,” the Council document said. Install at least 50 miles of protected bike lanes per year towards creating a “fully connected bike network.” “The city’s progress on installing protected bike lanes has been slow-moving and piecemeal, at best, resulting in a disjointed, disconnected system,” the document said. “The Council calls on the administration to significantly increase the installation of this critical, life-saving infrastructure to at least 50-miles per year, by including $40 million annually in the city’s capital budget for protected bike lane installation [and] complete a fully connected bike network by the 2026-2031 Capital Commitment Plan.” Last year, the city installed less than 20 miles of protected bike lane, a decrease from nearly 25 miles the year before, as Streetsblog reported. The city has made an iron-clad commitment only to make double-digit increases in protected bike lanes every year. Install more bus lanes, which are “one of the most efficient, cost-effective, and adaptive forms of public transit that the city can pursue.” Johnson wants the city to double its rate of creation of bus infrastructure — and “ensure that every new bus lane should be camera enforced and physically separated from traffic.” Mayor de Blasio has announced his own initiative to improve bus speeds by 25 percent. Install special signals that give buses priority at 1,000 intersections per year. The Council is asking the mayor to add $6.3 million to its current signal priority program. The mayor’s budget calls for only 300 signals to be upgraded, at a cost of $2.6 million. The proposals are already earning kudos from activists. 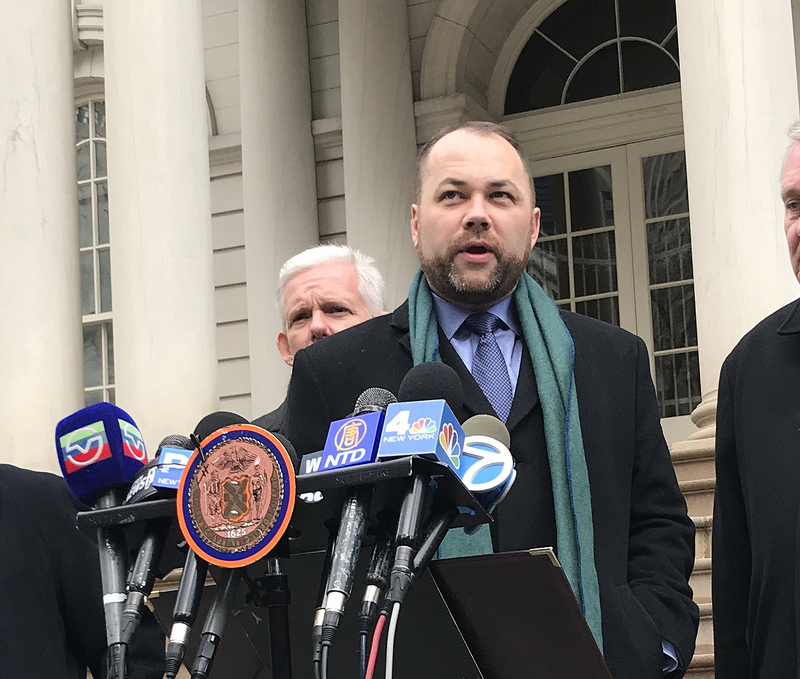 The overall Council budget suggestions would cost more than de Blasio’s proposed budget, but the document claims the added money can be found through efficiencies and other cuts. The document is technically authored by Johnson, Council Finance Committee Chairman Daniel Dromm and Capital Budget Subcommittee Chairwoman Vanessa Gibson, but it very much reflects transportation priorities identified by Johnson in his “Let’s Go” blueprint issued earlier this year at his State of the City address. In a statement this week, Johnson focused on the budget’s broader picture. We look forward to working with the City Council throughout the budget process to build on our success, including collaborating on ways we can grow our historic reserves. We also look forward to evaluating new needs while being mindful of the city’s mandatory savings targets and any economic uncertainty the city faces. Johnson’s transportation record is already heroic, what with winning Fair Fares, protecting and expanding speed cams, unequivocally backing congestion pricing, beginning to implement a wage standard for FHV drivers, etc. But his C.I.S. recommendation misses the mark. The most urgent need re NYPD crash investigations is to make every C.I.S. report public. Period. When you (S’blog) write that “Full investigation is seen as a key to better enforcement against reckless drivers,” you’re part of the problem. All the investigations in the world won’t change a thing until public health professionals, advocates, journalists and ordinary citizens have access to the crash forensics. I’ve written about this till I’ve gotten blue (haha) in the face. Here’s one instance, on this site: https://t.co/dLYskJAJAF. Let’s please stay on message.